Fans in attendance for Saturday’s Fan Appreciation Day will receive an Evgeny Kuznetsov figurine, which has an arm-twisting action for Kuzy’s celebrations. Washington’s game on Saturday, March 26, versus the St. Louis Blues is Fan Appreciation Day presented by Capital One Bank. All fans in attendance will receive an Evgeny Kuznetsov figurine courtesy of Capital One Bank. 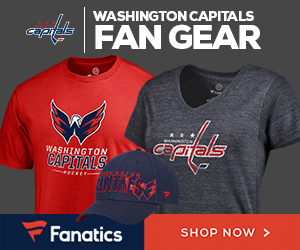 In addition, the Verizon Center Team Store will offer a 25% discount on regular-priced merchandise from 5-7 p.m. (excluding jerseys), 25% off headwear during the first intermission and 25% off all shirts during the second intermission. Following the game, the store will offer a Saves to Save discount, with the percentage discount off the full-price matching the number of saves made by the Capitals during the game, up to 30% (excluding jerseys). The day will conclude with the team’s Jerseys Off Our Backs giveaway. The jerseys will be autographed and presented to preselected fans following the game. Throughout the week of March 14, fans can vote or submit nominations for Jerseys Off Our Backs participants in the categories of Verizon Center Game Day Staff, Mite Moment of the Year, Scarlet Caps: Refer-A-Friend, Caps Kids Club: Your Best Wes, #CapsCare Community Leader and Caps in School Teacher of the Year.